There are reports that the Chicago Bears are shopping running back Jordan Howard. Howard, a former fifth-round pick in a draft that also contained Ezekiel Elliott, has compiled over 3,400 yards on the ground and over 2,150 yards after contact and is a perfect example of the replaceability of the running back position. 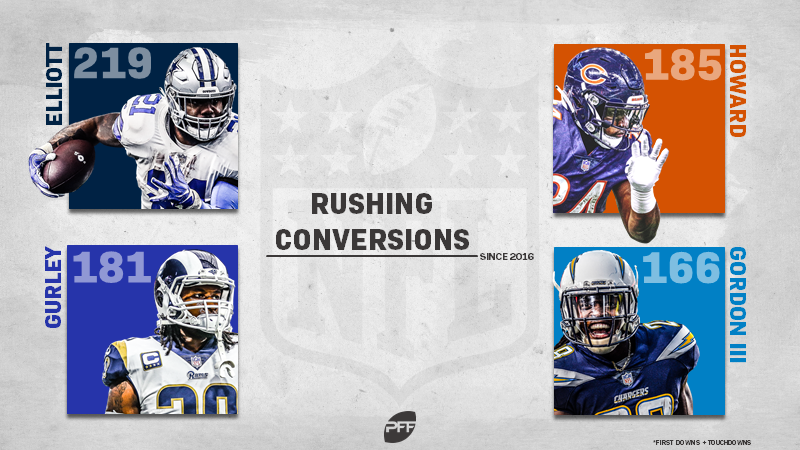 As such, he has been largely replaced in terms of value by 2017 fourth-round pick Tarik Cohen, who finished fourth at the position in wins above replacement (WAR), behind only Christian McCaffrey, Alvin Kamara and Saquon Barkley. With Cohen and likely the next running back de jour in the mix for Chicago, a good question is how much they could ask for in a trade to acquire Howard, a player who, despite his volume, has been roughly a shade above a replacement player through three years due to his drops (14 through his first two years, although zero last year), relatively meager effect on the passing game when he does catch the ball (568 receiving yards in three years on 0.75 yards per route run) and declining efficiency as a runner (from 5.2 to 3.7 yards per carry in three seasons). There are plenty of good running backs in the upcoming draft, many of whom will be available to teams later in the draft process due to an increased appreciation for the replaceability of the position. There will also be, as there always are, veterans like C.J. Anderson to be had for the league minimum during the course of the season, should a team decide not to buy a player like Howard. Howard has been productive (especially for his draft position) for the Bears the last three seasons, but his declining production (which has, ironically, come at a time when the Bears have increased their overall efficiency offensively), and his limitations where running backs add their most value (as a receiver) limit what we at PFF would likely dole out in a trade for the fifth-year player. In our opinion, as with Saquon Barkley last year in the draft, Jerrick McKinnon in free agency or Todd Gurley via the contract extension, teams should allow someone else to overspend for something that can be had for a far better price in a more rational world.